Video Bread: Learn bread baking at Your Public Library. Hi! I'm Steve and I have been teaching people how to make & bake bread at home since 1990. 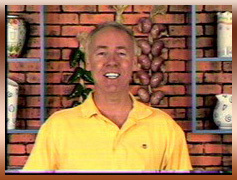 My original title, VIDEO BREAD, was the most popular instructional program on bread baking in the world. If you think that sounds like just another exaggerated claim made on the Internet, click on the following link to see if it is available at your Public Library. I have a whole New DVD Series. VIDEO BREAD has been retired and replaced by VIDEO BREAD 101 - Introduction to Bread Baking. I have my own approach to home bread baking. It is a scientific approach. To me bread baking is like an industrial engineering project. I want and get consistent results. My titles are building blocks. Work through them and you will become an artisan bread baker over time. It is like getting to Carnegie Hall - practice, practice, practice. There is no easier softer way. You can't just start out making an artisan loaf, although you'd think so by reading some of the sites on the Internet. Bread baking is a craft. You will never know it all. There is always more to learn. Learning right from the start is very important. Understanding the how and why of the bread baking process is key to learning how to make bread at home. It is essential that you have an understanding of the basics of bread baking before you can become an artisan bread baker. That is where my title VIDEO BREAD NOVICE comes in. You learn how to make a basic loaf of white bread. The science of what is going on and why in the bread baking process is stressed. You are instructed to control the temperature throughout the baking process by actually using a candy thermometer. This is for the novice, but it is part of the learning process. You are instructed to use 50% more yeast than other recipes call for to insure a great loaf on your first attempt. 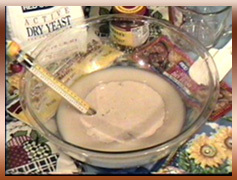 When half the flour has been added, an electric beater is used to thoroughly mix the yeast and cut down on kneading time. The actual kneading process is shown with close-ups. It is hard to know if you are kneading correctly from diagrams in a cook book. Time lapse photos of the loaves rising and throughout the baking process are given to explain in detail what is going on. You get a good understanding of flours and the function of gluten in the baking process. In the end you are shown how to tell if you loaf is completely cooked. The VIDEO BREAD series is not just about bread. I have been teaching people how to make incredible pizza for years. See my pizza title, VIDEO PIZZA PRO. For some reason there is a mind set out there that you can't make good pizza at home. That's just not true. Learn to make a better pizza that you can buy for next to nothing and just the way you like it. Learn to make muffins, VIDEO MUFFINS MAGIC, and other breakfast items, VIDEO BREAKFAST BAKING. I'm really big on bread machines/makers and have a title called VIDEO BREAD MAKER that is a must see. Check out my new VIDEO BREAD ARTISAN and remember the baker is the artisan and not the bread. You can also click on the Baking Photos link above to see some of the baked goods made in my titles. I have posted reviews at the link above titled Reviews. Try exploring the web sites of large food companies for recipes that are used in restaurants and not the usual mix of recipes that you will find on Internet sites. Have more questions? Write Me (videobread@gmail.com). I have been answering bread bakers' questions for years and enjoy helping people to become better bakers. I promote bread baking and would like to see more people start baking again. To purchase my DVDs click on Order Info for pricing, etc. I am sole source for my titles. They can only be purchased from this site. Yes, you can buy online or send a check or money order in US funds. The DVDs are practical hands on instruction and will show you basic as well as advanced baking concepts. All recipes are original and given on screen. Bread baking - beginner through artisan. How to make bread at home. Bread baking is a craft. Learn right from the start. All original recipes. Learn what else you can do with your bread machine, how to make pizza, muffins, sweet rolls, sour dough bread, pretzels, French bread, rolls and much, much more. Best of all it's free -- At your Public Library. Check it out! May your bread rise to the occasion!